I'm going touring on my Thorn Raven (A Rohoff-equipped steel framed tourer) in two weeks so I started off my preparation today by washing it, for the first time, I might add! I've had it 10 months, but it has superb mudguards and doesn't get very dirty. That's my excuse anyway. I've never been a frequent washer of my bikes as often I'd be doing little else in this climate. Having done that, I decided to try reversing the rear sprocket as I may have to do it on tour, and I'd never done it. I couldn't find the section in the manual so I started anyway, as one does. I've used numerous block removers in my time. I got my chainwhip, took off the quickrelease, put the sprocket remover on with it, got the chainwhip and started as one always did before, using the chainwhip clockwise. No budge. Got lever on it. No good. More effort. No budge. "Thinks...", as they say in comics. I wonder if it's the other way round? I Dig and dig and find tiny reference in manual. I HATE manuals which don't have everything in the index. The manual says that the correct direction is the opposite of what I've been doing. Now it's going to be really tight! No! It comes off on the first effort. I clean it. Have taken chain off and cleaned it by shaking it in a bottle of diesel and then washing in water and detergent. Put chain back on, put sprocket on. Turn pedals. Chain climbs sprocket and comes off. Must be stiff link? No. Hmm. Maybe chain too tight?. Check that with experimentation on eccentric bottom bracket. No. I must have reversed the sprocket unknown to myself. Not sure when I look at pattern of wear. Check internet. Can find no pictures of worn Rohloff sprocket, or useful ones of other sprockets. This is a picture of the sprocket, the wrong way round when looked at from right side of bike. This would be the correct way if I were fitting a new chain. You will see from this that there is a slight "hooking" of the teeth which in the wear pattern points towards the front of the bike, when it is the right way around. In other words the "hooks" will point towards the front of the bike as a sprocket wears. I've looked at this dozens of times in my time working on bikes, but it didn't really register until I needed to know it, and then what registered was that I was not sure! It's sometimes amazing what's NOT on the internet. I constantly found this when I was practicing medicine. Decide to reverse its current position so see if I'm right. Works perfectly. If you reverse a Rohloff sprocket you must use a new chain as the teeth in that direction will be as new and won't mesh properly with a partly-worn chain. I oil the chain. Allow to dry outside. Put tools away. Go to get bike to put in the garage. The front tyre is punctured. There's a rusty tack stuck in it! It wasn't punctured 15 minutes earlier! I fix puncture and put a new tyre on as I was going to anyway. Lessons learnt. Find out before doing anything even if it's really difficult to do so. Also, if I take anything off, photograph it first or mark it. Of course I won't fully obey my own advice. Who does? Posted by Garry on June 24th, 2010. Garry wrote: It's sometimes amazing what's NOT on the internet. That is true. I've spent ages searching for the amount of cable travel with an STI left lever compared to the equivalent MTB shifter, and I still don't know. You might know the answer. My tourer has Shimano Tiagra dual control ST-4500 levers that operate the gears and the brakes. I'm aware that those are road levers. It has a Tiagra triple front mech and a Deore XT rear mech. I'm also aware that those are a road mech and an MTB mech respectively, and that it doesn't matter if road and MTB are mixed on the rear, as the cable pull is the same for both, but that it does matter on the front because the operating arm on a road front mech is shorter than on an MTB mech and thus requires a different length cable pull. Well, okay so far, because Tiagra is road. But the chainset is Shimano Deore, for MTB, so my bike mixes road and MTB on the front, and the cable pull should theoretically be wrong, as the lever is road. 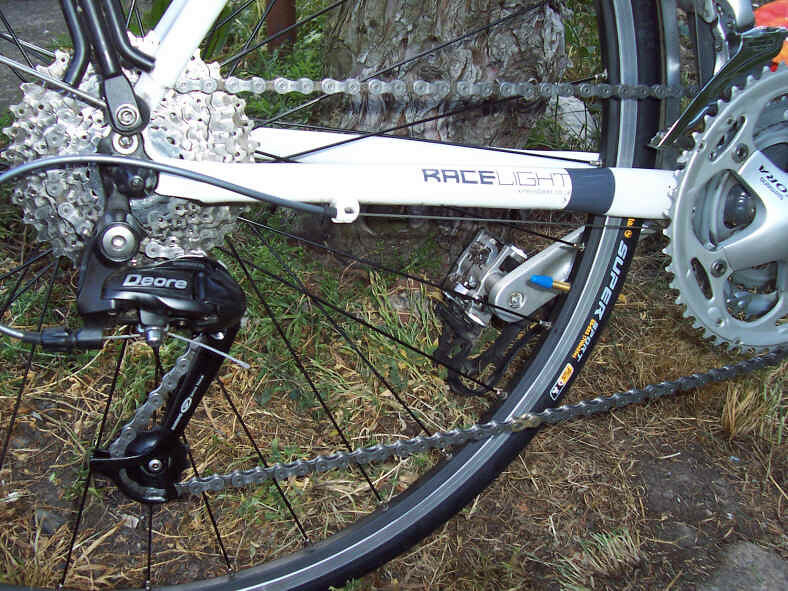 Now... the 2010 version of my tourer (mine is 2008) has a Deore front mech, not Tiagra like mine. I'm confused. What exactly is it that is not compatible between road and MTB? Does a road front mech actually move the same amount as an MTB front mech, even though the cable pull required to move it is different? I'm no bike mechanic myself. I'd prefer a nil-maintenance bike if that were possible. But I like to know how things work, and so far I've not been able to find the answer on the web. I would also like to know the different cable travel distances for cantilever brakes versus V brakes and which type of lever gives which length of pull. Again, hard to get the exact answer online (although I've discovered a new term: actuation ratio). I THINK that the MTB and road components are compatible as regards amount of pull. The shorter operating arm may be compensated for by a longer bit on the other end of the lever?? Don't know. The reason that I think they're compatible is that I've mixed MTB and road components on a previous tourer and well... they worked. I agree though that you CANNOT find this stuff on-line. Ive just done the very same thing to my Rohloff. Cept, I got the local bike shop to do it for me! I have cycled over 7,000 on the tourer and her front ring was very worn, the chain despite being tightened at least twice over the past 7 months has got more and more slack to the point where, in free wheel, the chain was clanking on the chain stay when going over bumpy ground. They have replaced the front ring, the chain and reversed the rear sprocket. As it happened, the wiring from the front gearing where it slips into the first brazen had shredded its protective casing and the wire within was fraying, so the poor lads in the bike shop had that big job to do as well. I left them with the manual, a brand new sprocket remover thingy from SJS and collected the bike the next day, much to their relief. Wish I were more handy round a bicycle for doing my own repairs and the such. Anything more than a puncture and Im a bit stuck. On the off-chance that I don't wake up with a head full of sludge in the morning after feeling a bit under the weather lately, I've given my bike a bit of a service. Dismantled the cassette and removed the chain. In removing the cassette I was hoping to reinsert the retaining rivets, but from the opposite side. I had to use a oval needle file to make the holes larger on one side of the plastic spacers to allow the rivet heads to fit in to a sort-of countersunk space. It worked, but I'm not sure it will make any difference. Fitted a new rear tyre after puncturing the other day. It is supposed to be even more puncture-resistant than the other one. Fingers crossed. Chris, that's a very slim tyre. I've always used a minimum of 28C on the back of a tourer. Being heavy, (14.12 at the moment), I'd get too many pinch punctures. Before I started cycling again I weighed over 13st. A few weeks ago I was down below 12st, but now I'm somewhere in between. Too much inaction, I suppose. The bike came with 700c*25 tyres (it's the same specification as the Ridgeback Horizon) and carbon forks that have barely enough clearance as it is (I've heard people mention that they can't get 28mm tyres – or was it 32mm – on their lightweight bikes). The new tyre is a bit more substantial than the old one and I'm going to avoid the sort of roads I punctured on a few weeks ago. The Kinesis Racelight T2 is supposed to be a training bike/light tourer/Audax machine anyway, so I'll not go heavy with it.